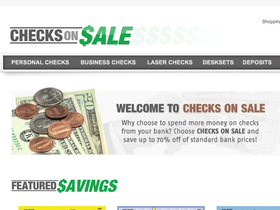 Check out Checks on Sale, online at ChecksOnSale.com, to spend less on the checks you need. Checks On Sale is the shop for saving up to 70% on checks compared to buying through the bank. ChecksOnSale.com offers discounts, and their checks are always on sale. Checks on Sale also offers a vast selection of unique check designs, personal checks, business checks, laser checks, deskets, deposit books, check covers, address labels, and ink stamps. But before you make paying the bills a little more pleasant (and cheaper), be sure to get all the latest ChecksOnSale.com discounts, Checks On Sale promotions, and Checks On Sale coupon codes found here at RetailSteal.com. Shipping rates are based on items and shipping method. See site for full details. Enjoy 10% off any Checks On Sale order of $10.00 or more! Click link and use coupon code to save. Shop at Checks On Sale and enjoy 20% savings on Business or Computer checks. Click here for code. Buy 3 boxes of checks at Checks On Sale, enjoy the 4th one for free. Click here for code. Click this special link to head over to Checks on Sale today and automatically receive a $3 discount per box of checks you purchase. Don't miss out on these savings; head over today. Buy your checks online at Checksonsale.com and save $5 off your purchase of $15.99 or more for a box of checks with coupon code. Shop at Checks On Sale to save up to 70% on your checks compared to standard bank prices. Click link to save. Visit Checks On Sale for checks as low as $6.99 per box. Click this link for great values on checks. Go to ChecksOnSale for Business Checks and get 300 singles for as low as $19.98. Click link to shop. Use our coupon code at Checks on Sale online today and save 20% on your purchase of $20 or more online.